What came in the set? In response to a reader’s question, I’ve started this comparison table of the different Spirographs that have been produced over the years. If you have something to add, maybe another set to add to the chart, leave a comment. UPDATE: Since making this chart, the new Super Spirograph has come out. It has the shaped wheels in addition to everything in my old Super Spirograph, from what I can see in the pictures. 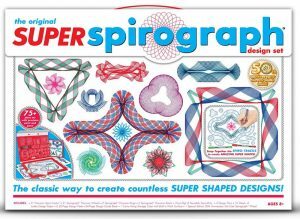 *Note 1: Super Spirograph also comes with “super parts” which are snap-together pieces for making a variety of shapes. These included 4 straight pieces in each of two lengths, 4 curved pieces in each of 4 lengths, with the same curvature as the 144/96 ring, a Y-shaped piece and 3 male and 3 female end pieces with teeth. Read more on our Super Spirograph page. Thanks for that Heather! Pretty sure I had the 1969 version, as I don’t remember any snap-together parts. Do you also have a list of the range of hole numbers on each wheel? I’ve just added the number of holes on each wheel for the two sets that I physically have. The Kenner Spirograph wheels were probably the same as the Super Spirograph. Not all of these sets are 100% complete, but I do have the boxes for them at least. I also have a some spare parts from sets without boxes. Sorry, I don’t. I just constructed it directly for the website. Since then I’ve learned that versions of the old Kenner Spirograph that came a bit later, and had the shaped wheels, did not have wheels 36, 50 and 64 – i.e. they had the same wheels as the new Spirograph by Kahootz Toys. Wheel 50 was a bit of a dead duck, but the omission of 36 and 64 was more of a loss, as we were shorn of the eight-pointed star (96/36) and the “trillium” (96/64). As an aside, the ugliest patterns were 105/32 and 105/64, as they were very dense and it was difficult to cycle colours along the way. 105/52 at least allowed attractive multicoloured patterns fairly easily. This set would never do for Spirograph addicts, but it makes a nice, additional set to have around for travel purposes or if you have kids… It does not contain a good working surface, however… so I would recommend a drawng board in addition to this small travel set… oh, and an extra source of paper… the 24 pages wouldn’t last much time at all. My tin says copyright 2012, the cardboard wrapper says copyright 2014. I’m uncertain when it first became available, but I purchased mine as part of a double set deal with the Kahootz Spirograph Deluxe Set last year. Thanks for that information. I’ll add it to the chart when I get a chance. I hope you continue to update this chart. I’m quickly becoming a Spirogradicct. Right now, I only have the design tin, but awaiting the arrival of a new Super Spirograph. And already obsessing about what I will still be missing out on after that arrives. I know I am getting way ahead of myself. I have not even mastered circle in ring patterns, let alone the bar and rack! Fascinating. I found an old commercial for Spirograph Plus which shows the cam arm: https://www.youtube.com/watch?v=fOZkgejZ-U8. That would make an interesting article, indeed. If you’d like to write about it, or send some pictures and we can put together an article, let me know. I’ve returned late to Spirograph, but am enjoying getting to grips with the designs I failed with as a youngster in the 1970s! I’ve bought both the modern version and a vintage 1970’s Super Spirograph. One tip to keep the bits and pieces secure in the tray of the vintage type, use tiny blobs of Spiro Putty (or similar alternative) to stick them to the tray. Stops them sliding about and renders them scatter-proof when the cat lands on the tray! Thank you! That is so brilliant I’d like to make it a fresh post – as soon as I can take an appropriate photo. If I had a cat…. Ooh, not many of my ideas are considered “brilliant” by people other than myself, lol! Please feel free to make a fresh post of it. I’m sure any of my three cats would be honoured to demonstrate, but I fear they lack the attention span and motivation to travel from the UK!